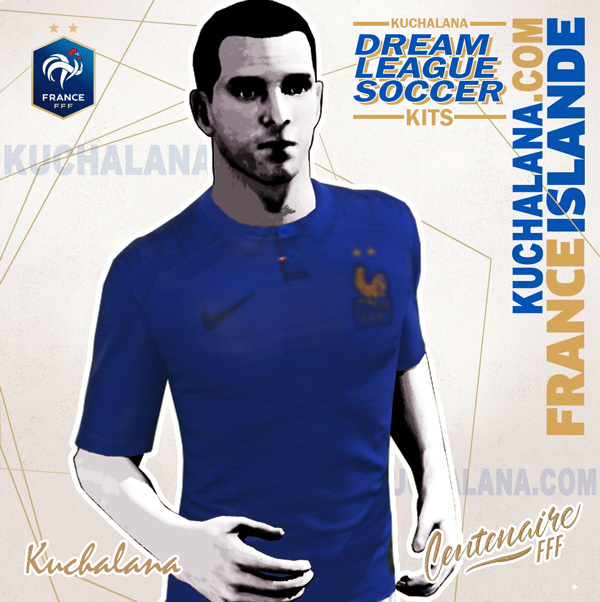 France 1919-2019 Centenary Kit for Dream League Soccer 2019, and the package includes complete with home kits, away and third. All Goalkeeper kits are also included. This kits also can use in First Touch Soccer 2015 (FTS15). Today has been officially presented the special edition shirt with which France will celebrate the centenary of the FFF (French Football Federation), which will be used only once in tomorrow's game against Iceland and sold in limited units. The t-shirt, only available in long sleeve in its commercial version, presents a simple design with retro air with a polo-neck button and incorporating the national flag in it. The iconic FFF rooster appears in classic form, with a box surrounding the initials and an inscription for its 100 years , in addition to the two World Cup stars. The Nike logo is painted dark blue, camouflaging in the design and contributing to the classic look. Finally, a special stamp commemorating the occasion can be seen on the inside of the neck. 5 Komen untuk "France 1919-2019 Centenary Kit - Dream League Soccer Kits"